material:ABS. 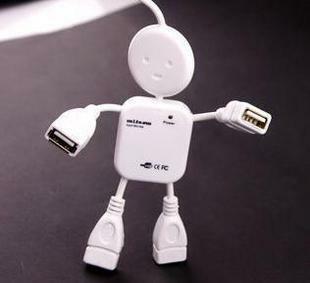 -4 port USBHUB.Human shape design.customer's color is accepted.logo is available on the cover surface. -Expand four USB ports,supply up to 500mA current per port. - Internal over current protection circuits. -Support USB 2.0.Compatible USB1.1.Full speed up to 12Mbps.High speed up to 480Mbps. -Design with super streamline & mini. -Support OS:Win95 OSR2/98SE/ME/2000/XP,Linux2.4 and Mac OS8.5 or over version.